Fall is officially here—at least in my kitchen. 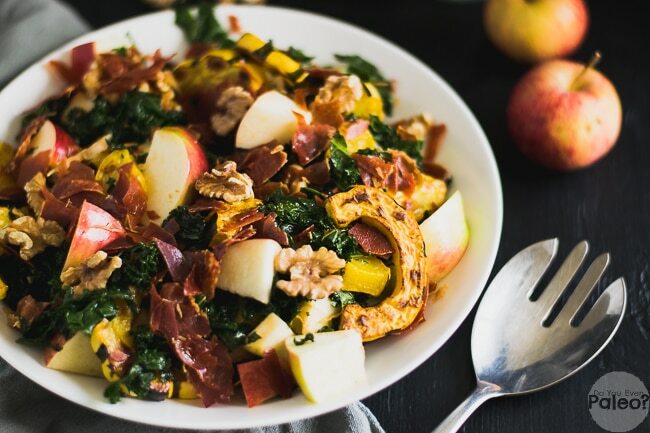 What better way to kick off the season than with a hearty and warm Fall Harvest Salad? 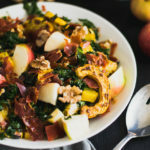 I based this salad heavily off of another favorite: Warm Winter Kale and Delicata Squash Salad with Maple Vinaigrette. Yeah, that’s a mouthful, I know…that’s why this recipe has a much shorter title! 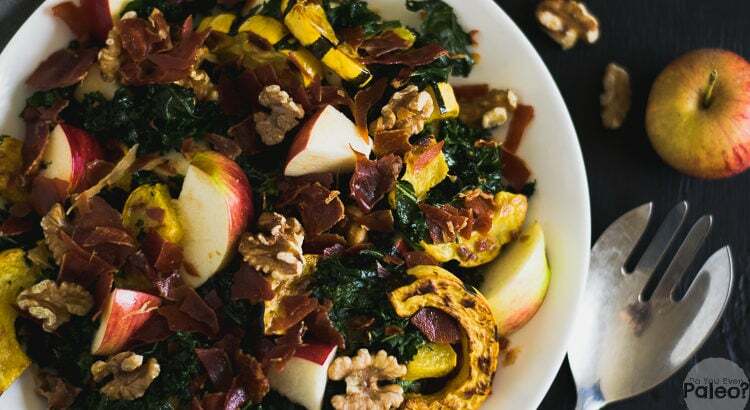 Just like the recipe I posted last year, this fall harvest salad starts with kale and delicata squash. 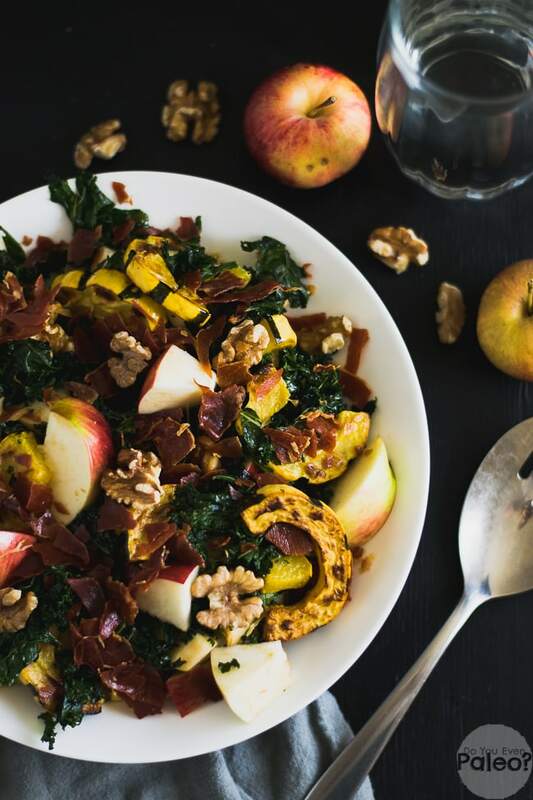 But this time, I added apples, walnuts, and crispy prosciutto—essentially a trifecta of sweet and salty autumn flavor. 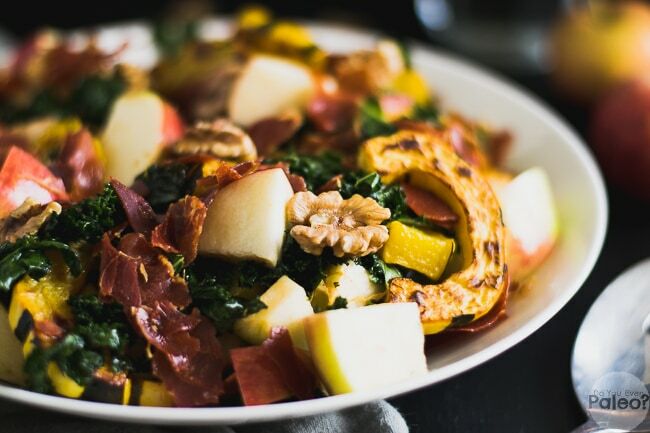 This recipe involves a number of steps, mostly because you roast the kale, delicata squash, prosciutto, and walnuts. I admit, that’s a lot of roasting! But the nice thing about “warm” salads is that they keep well. Prep this salad on the weekend and eat it throughout the week. The only thing you have to change is to add the prosciutto just before serving, since it loses its crispness if it’s kept in the fridge with everything else. I sincerely hope the prep time doesn’t turn you away from this recipe, though. Salads like this are high on my list of favorites! All the prep is worth it when you dig in. Now that I’m thinking all things fall, I regularly add oven-wilted kale to my meal prep time. It’s so flexible! I can always think up a quick salad with wilted kale. Recently I mentioned on Instagram that being unemployed is harder than I thought. 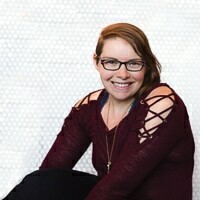 I assumed that while I’m looking for a new job, I’d have all this wonderful free time to create recipes, put all the work into my website that I’ve avoided, and catch up on the leisure activities that have fallen to the wayside. Not the case. My days used to be so structured and habitual, but without that structure it’s insanely easy to (1) get distracted and (2) lose myself in tasks that aren’t truly that important. It’s a learning experience, for sure. When I was a kid, my mom used to say I was her organizer. I can distinctly recall spending entire afternoons sorting all the buttons in her giant jar of spares. I’d dump out the various junk drawers in the house so I could reorganize them. I still find those kinds of tasks therapeutic…but for whatever reason, I can’t get my day organized! That’s a little more abstract than groupings of buttons. Suffice to say, I’m working on it. Consistency, workflows, and scheduling my day…I’ll get the hang of it. Anyone have any tips? I’m all ears! Preheat the oven to 350 degrees. Line a rimmed baking sheet with parchment paper. Lay prosciutto out flat on the parchment paper and bake for 10-12 minutes, until crispy. Be careful not to burn it! Transfer the prosciutto to a wire rack to cool and crisp up further. Increase the oven to 400 degrees. Toss the sliced delicata squash in 1 tablespoon of olive oil. Lay the squash out on the same lined baking sheet that you used for the prosciutto. Bake for 20 minutes, flip, then bake for an additional 10 minutes. Transfer to a large bowl. Roughly chop the kale leaves. 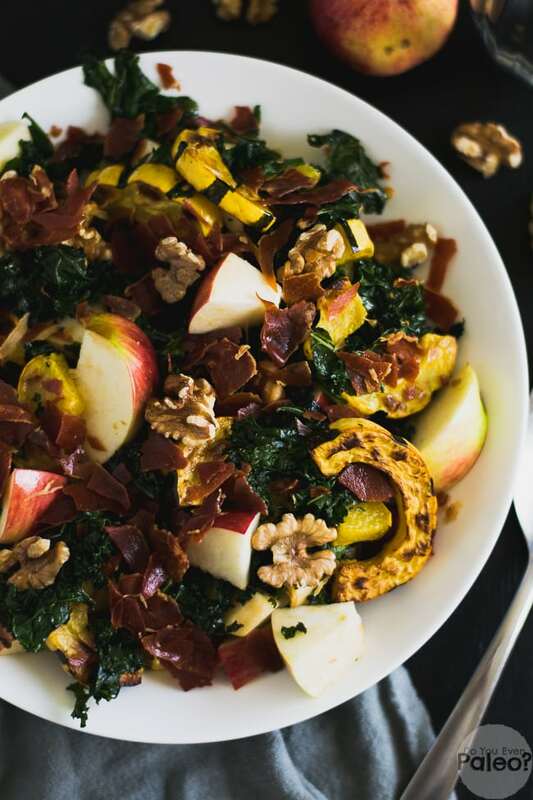 Drizzle the remaining tablespoon olive oil over the kale and massage it in with your fingers. Once all the kale is coated, transfer it to the same baking sheet that you used for the delicata squash. Bake for 10 minutes, until wilted and slightly crispy on the edges. Meanwhile, make the vinaigrette. Combine the extra virgin olive oil and rice vinegar, whisking until emulsified. 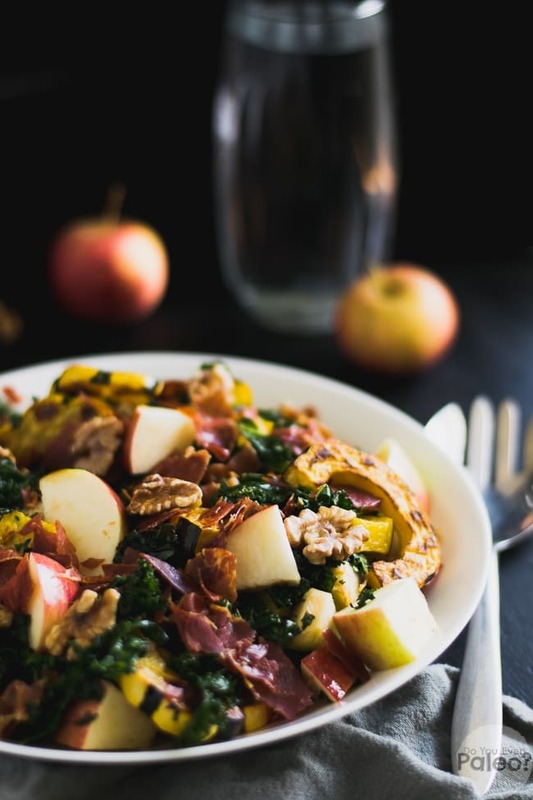 Combine the kale, delicata squash, chopped apples, and walnuts to a large bowl. Pour the vinaigrette overtop and toss to combine. Just before serving, break up the crisped prosciutto and stir into the salad. Serve immediately! Don't subscribe All Replies to my comments Notify me of followup comments via e-mail. 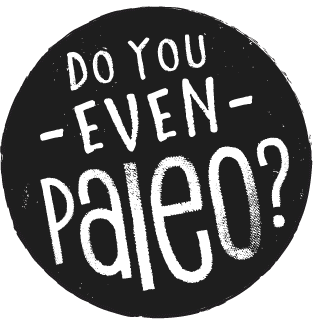 You can also <a href='https://www.doyouevenpaleo.net/comment-subscriptions/?srp=2933&srk=87505361eee98908ddf6ccb8681f50d6&sra=s&srsrc=f'>subscribe</a> without commenting.